The development of the law enforcement community to support the interdiction of weapons of mass destruction was the focus of a one week conference at the College of Criminal Justice at Sam Houston State University Nov. 30-Dec. 3. Sponsored by the Houston Police Department and the United States Intelligence Community, the program drew more than 200 police, fire, emergency medical, and National Guard personnel. 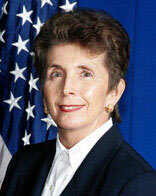 Kathleen Kiernan, a 29-year veteran of federal law enforcement and an active participant in the Intelligence Community for over 10 years, served as conference chair. She is currently leading a nationwide Intelligence Community project involving the active interdiction of weapons of mass destruction throughout the law enforcement and public safety communities. “The genesis for the collaboration project is the recognition that the challenge posed by terrorism can no longer be framed as the sole responsibility of the national level but must include the voice of the practitioners from across the first responding community," she said. "This voice, by necessity, includes the public safety arena, police, fire, emergency and medical personnel, as well as members of the private sector,” she explained. According to Kiernan, law enforcement historically has been in a reactive posture relative to criminal acts, convergence of events, or natural disasters which requires a proficiency in consequence management, disaster mitigation, and recovery efforts. The focus of this effort acknowledges the ongoing shift of public service agencies from a strictly reactive posture to one that is proactive, predictive, and preventative, she added. Kiernan discussed at length the relationship between criminals and terrorists. “Understand that while every criminal is not a terrorist, every terrorist is a criminal,” she said. "While motivations are often different, they exploit the same methods of deception and manipulation, recruitment, fund raising, and fraud." Thus, Kiernan noted, it makes good sense to incorporate the historical expertise of law enforcement personnel who are uniquely positioned to notice change or aberrant behavior, potential indications of criminal and/or terrorist activity. "In fact, one of the key precepts of community oriented policing has been the development of trust and credibility for law enforcement within individual neighborhoods which involves an active citizenry who are really the 'first' first responders," she said. Harold Hurtt, chief of the Houston Police Department, recognized that a homeland security strategy must include the entire public safety community as well as the private sector. "The threat posed by weapons of mass destruction on domestic soil reveals the need for increased collaboration and information sharing between law enforcement and the intelligence community across the nation," Hurtt said. "A shared awareness of all of our intelligence requirements will engender an increased vigilance for obtaining the information by all levels of government." David Webb, assistant director of the Bill Blackwood Law Enforcement Management Institute of Texas which is housed at Sam Houston State University, discussed the Incident Command and Simulation Training Project that is currently being developed at LEMIT. It will be coordinated into six types of programs that may be structured into one united program of preparedness for, response to, and recovery from major emergencies, disasters, and potential terrorist threats and activities. Stanley Weiner, professor of medicine at the University of Illinois presented a physical defense plan against bioterrorism for civilian populations. He explained how conversion of rooms would prevent bio-weapon casualties. "A sealed 'safe' room has its own emergency system that blocks particles and purifies the air from toxins," he said. During a bio-weapons attack, “medical defense won’t work but generic defense will work,” Weiner said. Other speakers represented the Terrorist Screening Center, the Homeland Security Operations Center, various agencies that are members of the U. S. Intelligence Community, private security, members of the Civil Support Team of the National Guard, and the medical community. “The venue of Sam Houston State University provided a unique opportunity based on its strong focus to educate practitioners, develop leaders, and enhance the skills of current and existing leaders," said Richard H. Ward, dean and director of the Sam Houston State Criminal Justice Center. "This conference provided investigators with new tools to put into practical use against terrorism and added depth to investigative capabilities,” he said.